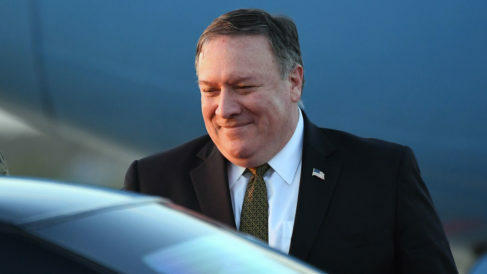 US Secretary of State Mike Pompeo hailed “progress” in talks with North Korean leader Kim Jong Un in Pyongyang Sunday before landing in Seoul on a whirlwind diplomatic visit to the region.The top US diplomat met with Kim for around two hours Sunday morning in the North’s capital, where denuclearisation and a second US-North Korean summit were expected to be high on the agenda, before the pair shared a lunch together. The visit was Pompeo’s fourth to North Korea. US President Donald Trump met Kim in Singapore in June for the first-ever summit between the countries. Speaking to Pompeo via an interpreter following the morning’s talks, Kim praised their “nice meeting”. After a previous visit to Pyongyang in July, Pompeo had said the two foes had made progress on key issues. But within hours of the Secretary of State departing the North released a statement condemning “gangster-like” demands from the US, raising questions over how much the two sides really saw eye to eye. Details of Sunday’s discussions were not immediately available. But prior to the meeting, Pompeo tweeted that he would “continue our work to fulfil the commitments made (by) POTUS and Chairman Kim,” using an acronym to refer to US President Donald Trump. But the unorthodox US president has also since declared himself “in love” with Kim. Washington and Pyongyang have sparred over the exact terms of their vaguely-worded agreement in Singapore, with the US pushing to maintain sanctions and pressure against the North until its “final, fully verified denuclearisation. Last month the North’s foreign minister told the United Nations there was “no way” his country would disarm first as long as tough US sanctions remain against his country. Pompeo landed Sunday afternoon in South Korea, whose dovish president Moon Jae-in has served as a go-between for the two sides.